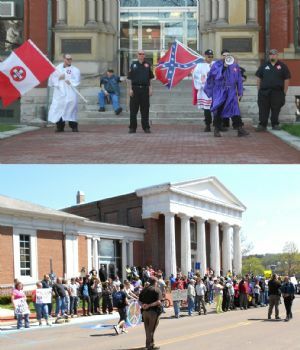 On April 26, 2014 seven members of the Traditional Rebel Knights of the Ku Klux Klan based out of Braddock Heights in Frederick, County Maryland staged a rally in front of the Allegany County, Maryland Courthouse. As shown here, they were met by several hundred protesters lined up on the other side of Washington Street in front of the Allegany County Public Library. The event lasted approximately thirty minutes. In the words of the Sheriff of Allegany County, "the restraint the citizens of Cumberland displayed was overwhelming." A separate community rally, led by local clergy members, was conducted at the same time a short distance away at the Canal Place Heritage Area. Several elected officials spoke and this event was attended by about 150 people. Saturday’s public rally of the Ku Klux Klan in front of the Allegany County Courthouse on Washington Street began a bit earlier than its announced start time and ended less than 45 minutes later when the rally participants drove away in their vehicles. No incidents were reported although the rally was met by several hundred people who gathered in the area of the courthouse to protest the presence of the KKK Traditional Rebel Knights from Braddock Heights near Frederick. The rally was scheduled to be held from noon to 1:30 p.m. but ended by 12:30 p.m. as the rally participants drove away in their private vehicles that had been parked in a lot just off Prospect Square at the rear of the Allegany County public library. Protesters surrounded the moving vehicles as police controlled the crowd. As the rally participants slowly drove away, a couple of protesters ran alongside their vehicles shouting words of protest. A large crowd converged on the vehicles before they left the area. The KKK event was held briefly on the courthouse steps where up to 15 officers of the Cumberland Police Department and the Allegany County Sheriff’s Office controlled the crowd. Traffic was heavy in the immediate area and in downtown Cumberland during the event. No through traffic was allowed on Washington Street in the area of the courthouse during the event. Additional police officers were reportedly were on standby and ready to respond to the area if they were needed. At the same time as the Washington Street rally was being held, hundreds of citizens gathered in the area of the stage at Canal Place in opposition to the KKK activity. After the KKK participants had driven away, the group at Canal Place — including a couple of elected officials — walked from there to the courthouse in a show of quiet, unified opposition to the hate group’s presence in Cumberland.